Double dipping is the act of actively playing two or more games at the same time. It is a practise that revolutionised professional online poker, and has even started to transcend into the wider poker scene. 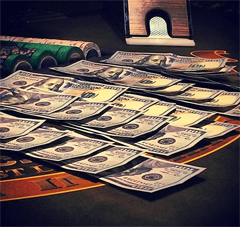 Multi-table tourneys are becoming more and more popular, both online and offline. It has become very popular with expert online players, who use the technique to really up their winnings and to keep them entertained. Call them adrenaline junkies, or poker guru’s – to run a few simultaneous, high stakes poker games takes a lot of skill if you want to win big. The best poker advice to give to n00bz is to try not to get too cocky – just because you won one game of poker does not mean that you are ready for a double dipping extravaganza. Online poker moves quickly and in order to keep up with the flow of money, the scatter of chips and what the other players are doing – you need a bit of experience under your belt. It is easy to get excited once you win the first few online poker games. Thinking; “I’m a natural!” is a great feeling, but it could be premature. Holding your nerve in poker is one of the most important things you can do. Anything can happen – and will your full attention be on the game if you have two or three others running too? It may be a good way to earn pots, but one wrong move and you could end up losing big time. It all comes down to whether you possess the skills to calculate several poker hands at the same time – it takes a lot more effort than you might think. The art of double dipping can be some amazing player’s only downfall. Even the most skilled player’s game can be turned upside down on account of the fact of their concentration levels are so stretched that they make basic mistakes. This explains why even some of the most experienced online plays refuse to double dip. If you spot a double dipper – perhaps you see the same user name appearing across a couple of games – then this weakness can be exploited and used to distract the player. Most players don’t even bother to hide the fact that they double dip, which is another mistake. Players that double dip are at risk of suffering from their lack of foresight, and this can be taken advantage of. They are not concentrating on just the one table, but instead have two, three or four games running at once. On a recent podcast, experienced American poker extraordinaire Eric Froehlich commented that he would never double dip because he feels like he’d be giving up too much equity. This from the man that claims nearly £2million in poker winnings, perhaps explains why even the most experienced and daring players think twice and often refuse to attempt to double dip. Have you ever double dipped, do you know how to win at online poker? Or did it end up in a massive fail for you? Let us know your thoughts in the comments below.